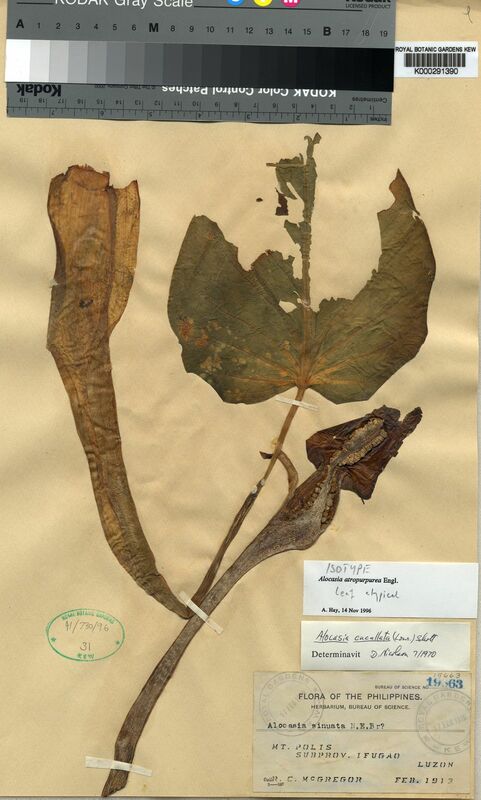 This genus is accepted, and its native range is Tropical & Subtropical Asia to E. Australia. Tropical and subtropical humid forest; geophytes or terrestrial, forest floor, in leaf litter, humus deposits on rocks, usually in deep shade, sometimes in exposed areas of forest regrowth. Trop. & Subtrop. Asia to E. Australia. Terrestrial or geophytic plants with colocasioid venation, leaves often peltate when juvenile; spathe constricted, spadix with an appendix, flowers unisexual, without staminodes. 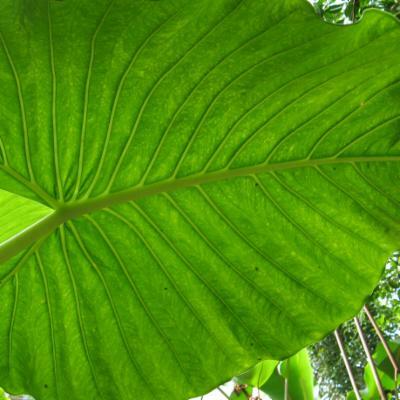 Differs from Colocasia in having entire, strongly sinuate or pinnatifid leaf blades (always entire in Colocasia ), basal placentation and few ovules. 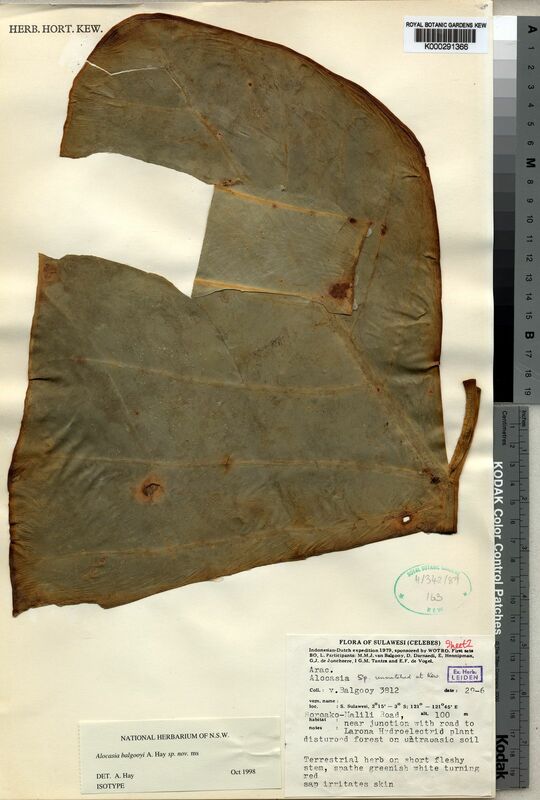 HABIT : medium-sized to rarely arborescent and gigantic, seasonally dormant to evergreen herbs, stem thick, often hypogeal, sometimes stoloniferous and bulbiferous, epigeal stem usually erect, with clear to milky latex. 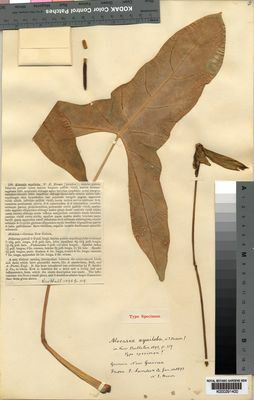 LEAVES : few to several in terminal crown, sometimes each subtended by a cataphyll. PETIOLE : long, sometimes asperate or glandular, sheath relatively long, sometimes deciduous. 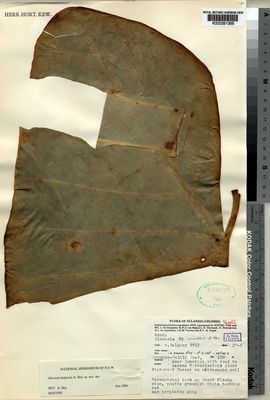 BLADE : sometimes pubescent, juvenile blade peltate, at maturity usually sagittate, less often ± hastate or cordate, peltate in some species, margin entire, sinuate or slightly to deeply pinnatifid, posterior lobes ovate or triangular; basal ribs well-developed, glands present in axils of primary lateral veins and midrib, primary lateral veins pinnate, forming submarginal collective vein,1-2 closely adjacent marginal veins also present, secondary and tertiary lateral veins arising from the primaries at a wide angle, then arching strongly towards leaf margin, sometimes forming interprimary veins,higher order venation reticulate. INFLORESCENCE : 2-many in each floral sympodium, appearing with the leaves. PEDUNCLE : usually shorter than petiole. 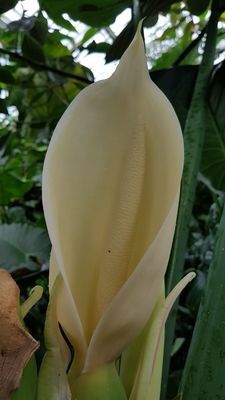 SPATHE : strongly constricted between tube and blade, tube with convolute margins, shorter than blade, ovoid or oblong, persistent and then splitting irregularly in fruit, blade oblong, usually boat-shaped, rarely fornicate, at anthesis at first erect, then reflexing and later usually deciduous; in Xenophya group blade is persistent, erect, convolute, gaping only basally. SPADIX : shorter than spathe, female zone short, conoid-cylindric, separated from male by a much narrower zone of sterile flowers, male zone usually cylindric, appendix conoid to cylindric, surface with irregular, labyrinthine network of fissures. FLOWERS : unisexual, perigone absent. MALE FLOWER : 3-12(-36)-androus, stamens connate into an obpyramidal, subhexagonal, truncate, rarely linear ( A. brisbanensis) synandrium, thecae linear-oblong, lateral, dehiscing by apical pore. POLLEN : extruded in strands, inaperturate, spherical to subspheroidal, medium-sized (mean 35 µm., range 31-39 µm. ), exine spinose. STERILE MALE FLOWERS : synandrodes shallow, obpyramidal, compressed, truncate. FEMALE FLOWER : ovary ovoid or oblong, 1-locular or partially 3-4-locular at apex, ovules 6-10, orthotropous, hemiorthotropous, hemianatropous or anatropous, funicle short, placenta basal, style short, stigma depressed-capitate, ± distinctly 3-4-lobed. 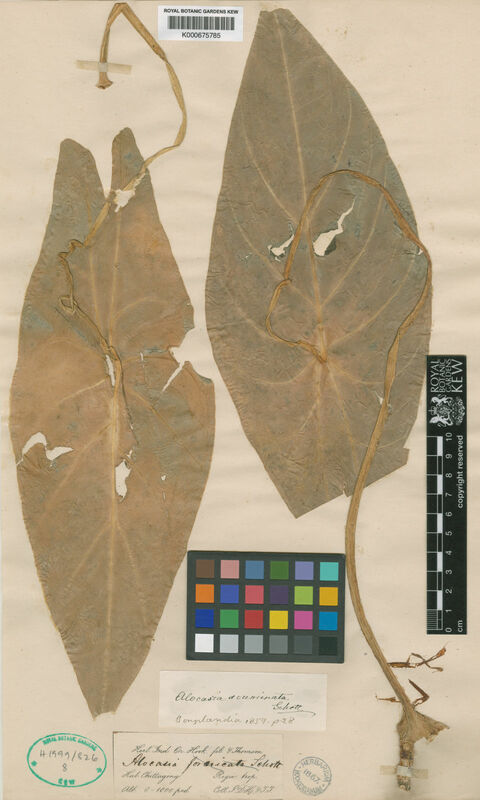 BERRY : generally reddish, ellipsoid or obconic-ellipsoid or subglobose, 1-5-seeded, stigma remnants persistent. SEED : subglobose to ellipsoid, testa thickish, smooth or scabrous, embryo broadly conoid, shortly cylindric or elongate, endosperm copious. Ascension, Brazil Northeast, Caroline Is., Chagos Archipelago, Cook Is., Costa Rica, Cuba, Dominican Republic, Fiji, Galápagos, Gilbert Is., Guinea, Gulf of Guinea Is., Haiti, Hawaii, Honduras, Jamaica, Kermadec Is., Laccadive Is., Leeward Is., Maldives, Marianas, Marshall Is., New Caledonia, New Zealand North, Nicaragua, Niue, Ogasawara-shoto, Paraguay, Portugal, Puerto Rico, Samoa, Seychelles, Society Is., St.Helena, Sudan, Tibet, Tokelau-Manihiki, Tonga, Trinidad-Tobago, Vanuatu, Venezuela, Venezuelan Antilles, Windward Is. 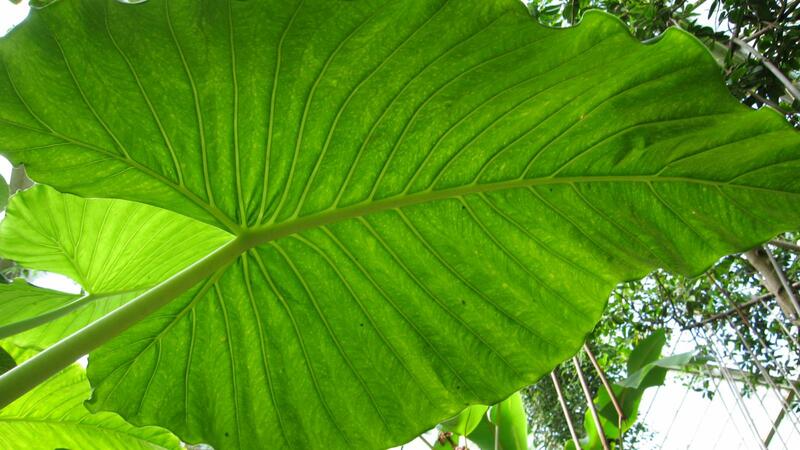 Alocasia devansayana (L.Linden & Rodigas) Engl.